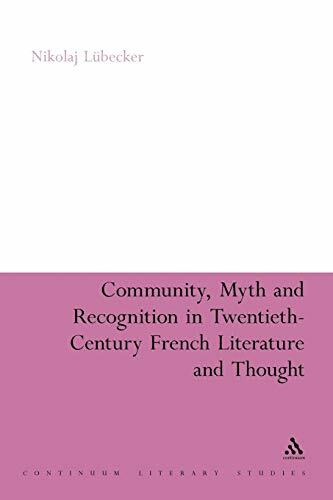 Taking as its point of departure the notion of community in mid-twentieth century French literature and thought, this ambitious study seeks to uncover the ways in which Breton, Bataille, Sartre and Barthes used literature and art to engage with the question of reconceptualizing society. In exploring the relevance these writings hold for contemporary debates about community, Lubecker argues for the continuing social importance of literary studies. Throughout the book, he suggests that literature and art are privileged fields for confronting some of the anti-social desires situated at the periphery of human rationality. The authors studied put to work the concepts of Thanatos, sado-masochism and (self-)sacrifice; they also write more poetically about man's attraction to Silence, the Night and the Neutral. Many sociological discourses on the question of community tend to marginalize the drives inherent within these concepts; Lubecker argues it is essential to take these drives into account when theorising the question of community, otherwise they may return in the atavistic form of myths. Moreover if handled with care and attention they can prove to be a resource. Nikolaj Lübecker is Fellow and Tutor in French at St. John's College, Oxford University, UK.